Click Here To Get Started Right Now? ‘Ask The Expert’ – Unlimited Support Package? The Average industry standard permanent makeup training courses range from 3 to 7 Days. You will get a good grounding but in no way will it make you an expert in permanent makeup overnight. If you’re like most technicians you only spent 1 to 2 days learning each permanent makeup technique at your initial training, which doesn’t really give you enough time to fully learn or perfect your skills. 90% of permanent makeup training companies will not train you in advanced methods as they expect you to pay for more advanced training. You will find that most permanent training courses usually provide masses of theory, text and quick demonstrations from your tutor in room full of students, however you don’t get step by step guides to perform perfect treatments every time. Most students rarely get to contact their original trainer once they have completed their course as this is not offered to you as an option on most courses. You may find your trainer is proficient at training in the classroom but does not perform treatments in their own clinic. Therefore they cannot advise you on handing customers problems and issues on a day to day basis. You may be tied into buying one set of pigments from your original training company which can restrict you from experimenting to get the best results for your clients. So is it hardly surprising that many permanent makeup technicians are left feeling cast out in the cold with no one to turn to. This would effect the confidence of even the most ambitious new recruit and can bring what you thought would be a promising new career to an earth shattering holt!! In This 294 Page double volume manual you will get a full feast of real life close up examples, useful illustrations, step by step instructions & business templates to follow. As a result, this will help you to perfect your techniques and you will be provided with immediate action plans of how to practice proven and tested formulas for producing amazing permanent makeup procedures and the ability to fully perform Eyebrows, Lips & Eyeliner procedures with confidence. And this can be achieved no matter what machine, pigment or previous training you have received!! Although it’s powerful to have a set of rules and guidelines to follow, like most of our students, you will find that with our specific step-by-step easy to follow examples, getting these simple procedures perfect will all make complete sense to you. Also by having access to your own personal mentor to answer any queries or questions will give you the full support you need to gain in both skills and confidence leading to more clients and higher fee’s. Katy Jobbins, Founder & Master Trainer of the Multi-Award Winning Permanent Makeup Training Academy. 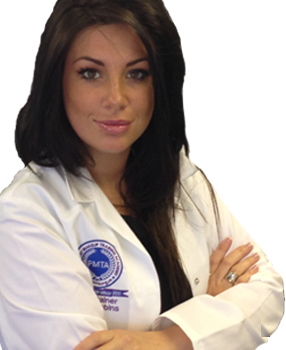 Its no secret that UK based Katy Jobbins is one of the youngest Permanent Makeup Master Trainers in the world. However this has not stopped her scooping a large number of national awards including the Award for ‘Innovation in Training’ at the 2012 Business Matters Awards, the 2010 Creme de la Creme award for ‘Outstanding Achievement in Her Field of Business‘, previously won by billionaire Sir Richard Branson & the 2009 Award for ‘Best Customer Focus’ at the National Best Business Awards. Katy is also an Author & the resident permanent makeup expert on the Advice panel for top industry magazine ‘Salon Today’ & in 2013 was quoted in the Guild News as a ‘YouTube Training Sensation’. Katy has personally performed over 10,000 permanent makeup procedures to date and trained & educated thousands of permanent makeup technicians worldwide via her books, DVD’s, Audio CD interviews, Membership Sites & Online Tutorials. She also has a black book of ‘A’ List Celebrity Clients. She has trained top celebrity tattooists, cristian dior makeup artists, Doctors, Nurses & Cosmetic Dentists in the art of Permanent Makeup, international tv personalities as well as training world famous Harrods Makeup Artists. She was personally approached by top Para-Medical Cancer Care Specialists to train them in her personal style of Natural Hair Simulation Eyebrows for their patients. There are specific things that some of the best permanent makeup artists on the planet know but don’t necessarily tell you..such as where you can find the best clients for permanent eyebrows. Some permanent makeup trainers don’t tell you all they know…because you didn’t know to ask and they didn’t think to tell. I am going to be very open and honest to you in exactly what it is you need to know. Some trainers who do not actively run their own permanent makeup clinics, lack the knowledge and understanding of dealing with real clients (they are only used to working on non-paying models), on a day to day basis, that their training process is like the blind leading the blind. Why is Katy Willing To Help Other Students Who Haven’t Personally Trained With Her … Giving Away all Her Permanent Makeup Secrets??? If you want in-depth, rock solid information as well as tips, tricks, trade secrets, tried and tested techniques and formulas that will make your clients line up and practically beg you for Permanent Makeup appointments then you have come to the right place!!! Katy has had her own personal problems within the permanent makeup industry, having a backlash from other trainers, having achieved a lot of success at such a young age in a relatively short period of time. She was devastated when she was banned from training any further from 2 major training companies as well as one of her own personal permanent makeup hero’s in the UK, due to them not wanting to share their secrets or trainings anymore with her after she created her own successful training academy. Although flattering that they saw her and her The Permanent Makeup Training Academy as such a threat to their business, it inadvertently turned out to be one of the best things that could have happened to her. Because of these problems, Katy had to go further afield, finding the best individual technicians that would not know her or see her as a competitor to their business for the level of training she desired. …to go against the grain & blow the lid of this very secretive & competitive industry, by sharing with you every thing she has learned about Permanent Makeup so that this never happens to you, no matter where you originally trained or where you intend to take your career. She also welcomes any other trainers (including the ones that banned her) to join this programme, to show that there are no hard feelings! By Purchasing This One of A Kind Permanent Makeup Technicians Support Package You Will Get To Know How To Perform Permanent Makeup Procedures Better than 95% of Your Competition. In Fact, You Will Be Running Rings Around Them !!! Because 95% of permanent makeup technicians stop learning once they finish their initial 3 to 7 day permanent makeup training courses. And NONE of this stuff is taught as in depth at any other permanent makeup training school. Even if you are already the best permanent make up artist in the world then I advise you still to get your pencil, note pad and highlighter pen out and absorb these points like a thirsty sponge!!! Well when you consider it would normally cost you £1250 just to spend 1/2 a day with Katy for a one off advanced training consultation. And it costs over £8000 to attend her permanent makeup start-up training course, or £2500 to attend the Academy’s own unique 3 Day Business & Marketing Master Class workshop! Then I’m sure you would agree that £1000 per month would sound very reasonable to get unlimited direct access to mentoring from Katy along with all the secrets in the Top Secrets And Tips Manual. However, as you will have read above, Katy is keen to share her wealth of knowledge with those dedicated permanent makeup technicians that want to learn from the best of the best. Therefore, Katy has said that this service has to be affordable to any level of technician from those just starting out to those who have been in battling in the trenches for years. Just £397 per month for a minimum of six months. 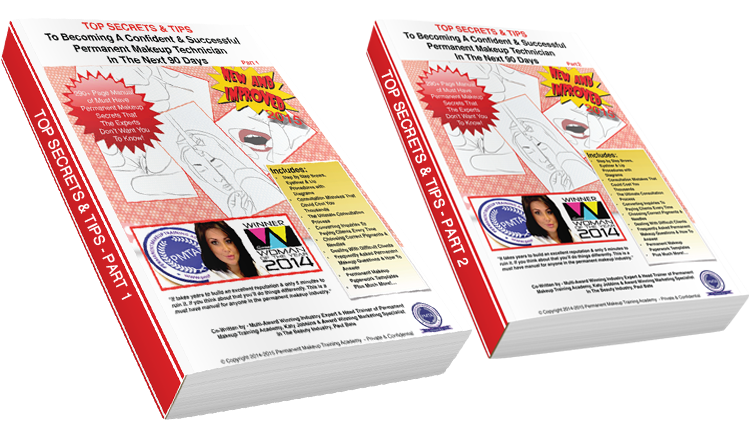 After subscription you will be taken direct to the members area where you can instantly download the Top Secrets & Tips Manual straight away. Katy will also arrange to have a welcome chat with you. There is a reason why some permanent make up technicians do much much better than others…. I’m going to hold your hand and tell you how you can too. Whilst Katy would like to provide this mentoring service to all that need it, there is a finite number of technicians that Katy can take on and support properly. Whilst the PayPal button appears on this page then you can sign-up. But don’t think about it too long as it will be taken away once the limit is reached. If you think you can do without this mentoring package, then you are right you can! However, Katy has personally spent over £100,000 in her permanent makeup education to be able to teach you the secrets of perfect Permanent Makeup. This mentoring program is designed to quickly increase your skill level and cut years off your learning time. However if you truly want to master the art of creating perfect brows, and being one of the most in-demand pm techs in your area, then this program is designed for exactly that. Given all the new techniques you will quickly learn both in treatment skill and business skill you will have so many more clients that the monthly price of this program will see like pocket change. P.S. Never be on your own again. You are just one step away from producing the permanent makeup that you know you are capable of & always dreamed of. P.P.S. Limit your touch-ups, eliminate your client complaints & remember my personal philosophy is that the more you learn.. the more you earn.